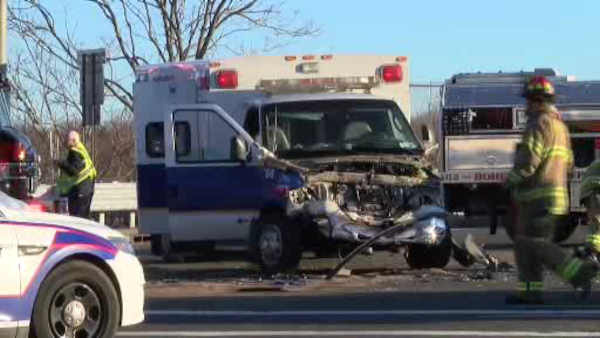 BOHEMIA, Long Island (WABC) -- Four people were hospitalized after an ambulance collided with an SUV on Long Island. It happened Sunday on Sunrise Highway in Bohemia. Police say a private ambulance was traveling north on Oakdale-Bohemia Road when the ambulance and a Suburban traveling westbound on Sunrise Highway Service Road crashed at the intersection at approximately 5:50 p.m. The Suburban overturned and struck a sedan traveling southbound on Oakdale-Bohemia Road. Two people in the Suburban and two people in the ambulance were transported to Southside Hospital for non-life-threatening injuries. The two people in the ambulance are employees of the ambulance company. They suffered head and back injuries. There was no patient in the ambulance at the time.